If you've driven by a church lately, you've probably seen a church sign. It may have been a high-tech digital sign on a pedestal that can be read from a block away, or it may have been a simple and traditional changeable letter sign sitting in front of the church. In both cases, you may have wondered when this tradition started and how it's evolved through the years. Here's a very brief look at the history of church signs. In the first half of the 20th century, churches seemed to rely on their unique architecture and close-knit church communities to get out their messages. Members know what was coming up because they attended every Sunday and got the messages they needed inside the church - if they couldn't make it to service, they could simply ask a friend or a neighbor for more details. A few churches had rudimentary signs back in the 1920s and 1930s, but usually, when you look at historic photos of old churches throughout different areas of the country, the first signs are visible in photographs from the 1960s but not in photos from earlier decades. During the 1960s and into the 1970s and 1980s, churches began embracing more signs. Often, these signs were framed in wood. Sometimes, they featured brickwork that matched the church. They tended to share straightforward messages about service times, weddings, Bingo games, and fundraisers. By the 1990s, church signs were starting to get a bit more amusing. In 2011, Texas Monthly published a fascinating story about a church sign writer from Amarillo. She took over sign changing duties in 1990 when she became the church secretary, and by the time the article debuted, she had been the church sign writer for over 20 years. In the days before the internet, she couldn't just search for a Pinterest board or a blog with ideas for church signs. Instead, she had to keep a binder full of church sign ideas, and she tried to be pithy and amusing with her efforts. She likens the sign's messages to a Facebook post, a way to let the community know what's happening in the church while also sharing some joy and levity. Over her years as a sign writer, she learned that people tended to like funny church signs more than serious ones - at one point, when one of the pastors started posting on the sign, she had to take back the reins because the congregation found his messages too "preachy". Arguably, that is not an isolated trend. Around the country, people tend to respond positively to upbeat messages. With the publication of these books, church signs went from the church niche into the newly emerging hipster culture. In fact, the trendsetter store Urban Outfitters sold photography books of church signs for young people to place in their trendy urban lofts. By 2007, church signs had become a phenomenon, and the internet was excited. Designers built websites that generated messages for church signs, websites showcasing and comparing church signs appeared, and chat boards begin to light up over discussions related to church signs. For example, when a church in Massachusetts posted the message: GOD IS NOW HERE on its church sign, people noticed issues with spacing, and they thought that the sign appeared to say GOD IS NOWHERE. After the story broke on Reddit, church members returned to the sign and increased the size of the space to make sure their intended message was loud and clear. About five years ago, church signs were so pervasive that analysts were starting to notice trends. A 2013 report in the Washington Post indicated that churches often change the spirit and the intensity of their messages around Easter. While many churches go for jokes or quotes from celebrities ranging from Oprah to J.K. Rowling during the rest of the year, they often get a lot more serious around Easter. As the most significant Christian holiday, Easter is time for reflection about the passion and resurrection of Jesus Christ, and churches often decide to put Bible verses or calls to attendance on their signs at this time. The Washington Post contacted Stewart Signs for a comment on this article, due to our position as one of the nation's leading providers of church signage, and our spokesperson agreed that this trend was indeed happening. As of 2018, the church sign trend is still going strong. Many churches use changeable letter signs to spread the good news and sprinkle in some jokes along the way. 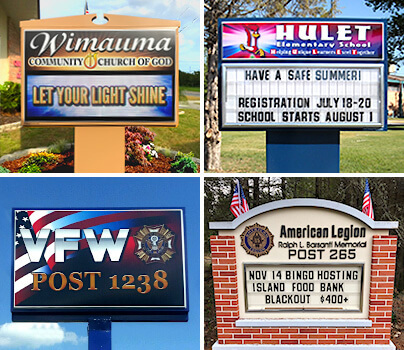 Around the same time, church sign messages were reaching their fever pitch, many churches took a leap into the future and started using LED church signs. LED signs allowed churches to share their messages, add graphics, cycle through different content easily, and even integrate videos. Outside, churches used digital signage to announce weddings, post services times, and share community service messages. They placed these signs on traditional poles and pedestals as well as on large crosses that changed color throughout the night. Inside, churches started using LED walls to modernize their worship environments. LED signs can show close videos of praise and worship bands, pastors, and inspirational speakers so that people in the back can see. They create backdrops with lights or charming scenes to enhance what's happening on the stage or alter. Digital signs can also post the lyrics of songs or closed captioning for speeches, show video of people in the pews, or project the church's messages in other ways. LED signs also started replacing the audio-visual equipment that had traditionally been used in Sunday School rooms and Bible study sessions. If you have a church, you need a sign. At Stewart Signs, we create signs for churches, schools, municipalities, and more. To learn more about how a sign can help enhance your mission or to get a quote on a custom sign for your church, contact us today.